As an online business owner, you already know that your website is a very important tool for marketing your brand and reaching your target audience. Web design in your eCommerce website is a new frontier for the modern business. While it presents endless opportunity to reach people all across the globe, it also is full of traps and missteps that could easily derail even the best laid plans for successful online business. However, identifying these traps is not that easy as it sounds. A simple list of some of the most common web design mistakes might help you identify these traps. Has your business committed any of these top 10 mistakes? 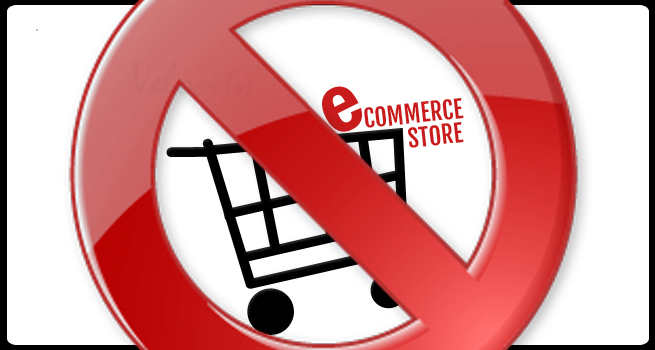 If not, then try these 10 ways to kill the online sales and presence of your eCommerce store. 1- Use images of poor quality- The common web design mistake is the failure to find that one quality image for the home page of your site. Irrelevant product images fail to convey the right message to your customers. Secondly, using blurred, heavily compressed, re-sized and stretched images also makes a website look untidy and can even frustrate the visitors. Using un-optimized images are another danger of web designing. 2- No “Call To Action” Buttons- Call to action buttons are important because they funnel your visitors further into your site. By keeping website users on your website for a longer amount of time, you”ll lower your bounce rates and increase the chance of conversion. It also improves user experience by directing users exactly where they want to go. If you sell products online, you would have a call to action button for users to “Buy Now” or “Add To Cart”. 3- Lengthy and time taking checkouts- Requiring visitors to answer too many questions on the way to checkout may just kill a sale for you. Do not put your questionnaire before the consumer has to checkout. If he has to go through more than 3 steps before clicking on check out, he will leave your site. This happens on a regular basis because many websites still don’t understand that customers want a fast and secure experience when they shop online. They don’t want to go through long check out. As a result all websites should consider a one page checkout solution, which is fast, easy and can be completed in a minute or less. 4- Not having a Mobile Website- With more and more people accessing web via mobile devices, answering the question, “Should I have a mobile version of my website?” seems like a no-brainer. As a business owner, you should connect and engage your customers. Mobile advertising increases brand identity. Websites that don’t load quickly or display properly frustrates customers. More than 50% of smartphone users say that they are less likely to engage with a company that presents bad mobile experience. 67% of mobile users say that a mobile-friendly site makes them more likely to buy a product or service. Chances are, if you build your mobile website now, you will beat your competition to the punch and boost sales. 5- Use Outdated and Copied Content- Nothing will kill your online business more quicker than out of date web content. If a website visitor returns to your site only to find the same information time after time after time, he will click away and never return. You need to show that your business is active and give them a reason to come back to your website. Give them fresh and timely content. 6- Have poorly navigating website- Poor websites are of no use. Always remember that the primary goal of a web design is to meet user’s demands and expectations. This can only be achieved with an effective design, for a poorly designed website it is of no use. Poor web design only leads to poor load time, poor content, poor navigation, poor browser compatibility and on the whole poor performance and appearance. It is one of the best ways to kill an eCommerce website. You need to make sure that both your visitors as well as search engines are able to “navigate” your website with ease. Make sure that every page uses the same template,color and design. Your customers will start developing trust in your business and start seeing you as a brand. Use the top left hand side of page for any menus. It’s always good to include text links to each page and have a site map to make sure that Google can find every page on your site. 7- Say “NO” to Social Media- I know you guys have heard of this word many times. Don’t worry I am not going to bore you with the same repeated information. If you avoid social media platforms then you are loosing approx 60% of revenue for your business. Saying “No” to social media is simply ignoring a huge amount of traffic ready to enter your site. Without a doubt, social networking is one of the inevitable forces on the web right now. Without incorporating Facebook and Twitter in your business, you won’t know what exactly your customers look for? What do they say about your products/services? No advertisement means no brand awareness. You will certainly loose your identity in this competitive market place, if you do not have social media options. Not having a social media presence will hamper your organization’s productivity with no platform to collaborate and work in co-operation. 9- Not including Shipping Rates- Keep the options and rates clear and be sure that final shipping charges are confirmed on the confirmation page of the ordering process. One option to simplify shipping rates is to charge a standard shipping price per order size. Calculate the shipping rate you should charge based on average freight rates to different delivery zones. Regardless of how you charge for shipping, be sure to confirm the charges on confirmation page. Unexpected shipping charges that appears on customers’ statement do not ensure a positive customer shopping experience and may result in charge backs. Now-a-days, consumers have become a lot more cautious when it comes to online shopping and prefers using accounts with Paypal or Moneybookers. This way, they do not have to disclose their bank account or credit card details each time they do online transactions. Once you have decided to use a multi payment system, you will be surprised with the increasing number of sales. What you offer should always benefit your customers. So make sure that there are several number of payment options available in your site. Not everyone has a credit card. Not everyone has Paypal. Be considerate, go the extra mile and offer them options. Make it easy for your customers to buy and pay. They will remember you for it and will surely come back.